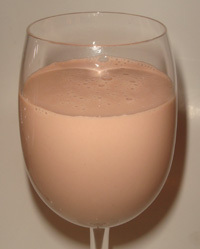 Chocolate milk was always a treat growing up. Not that we weren’t allowed to drink it but it’s just so good that no mater when I had it, I always savored it. I always just made it at home and rarely found the same satisfaction when I bought it in a bottle. It’s been awhile for either home-made or bottle so we compared a national big boy brand with the beloved Hood brand of New England. Nesquik had a great chocolatey aroma which I was hoping hinted at the intensity of chocolate flavor. For me the just tasted like milk with a hint of chocolate. Ethan felt it wasn’t lacking any favor and enjoyed it. I thought this had an artificial taste to it but Ethan didn’t think it was bad. There was just something off about the consistency to me, like I could tell it was made from powder even if I didn’t already know it was. Hood didn’t have a sweet chocolate smell like Nesquik did but we both found the taste was a more sincere chocolate flavor. Ethan said it tasted like when you ignore the suggested amount of powder to add to make chocolate milk and add an extra tablespoon (or two). I liked that this didn’t taste as chemically and would like to think that it was a more pure form of this drink. I prefered good ol’ Hood for the reasons listed above, although I have to say I feel Hood’s expertise is in their ice cream products (I mean, what’s better than a Hoodsie eaten with a wooden spoon?) and wouldn’t swear by their chocolate milk as a new favorite. Although Ethan agreed Nesquik was more artificial tasting he still found something appealing about it. He liked both in their own way and said it would depend on his mood as to which one he would buy again. I prefer to make my own, that way I can add as many spoonfuls as I like! I find these kinds of drinks not sweet enough.. 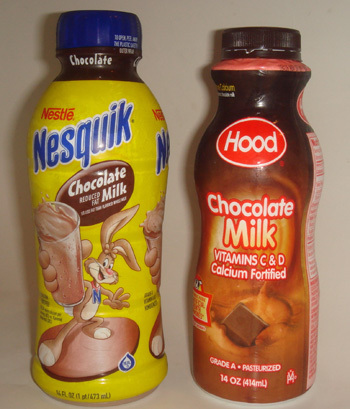 I recently bought NesQuik chocolate syrup to add to my own milk & it also had an artificial taste to it. I think they try too hard. I only drink Hood milk. Namely because it’s all local here in New England and because their light-block bottles actually do keep milk fresher longer. I have had their chocolate milk before and I’d have to give it the nod over anything to do with Quik, either premade or from the powder container. However, I’d like to see a comparison to Hershey’s chocolate milk. 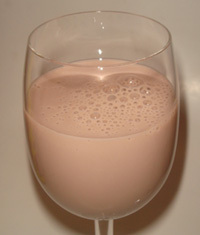 Hershey’s syrup was the product of choice for our chocolate/strawberry milk mix and I’m pretty sure they make a pre-bottled chocolate milk. They used to have these bottled milkshakes that were really good – the Cookies and Cream especially. I’ve always preferred making me own at home, anyway, with chocolate syrup. Tastes better and I can control how chocolatey my drink is. I have always preferred the hard to find Hershey’s Chocolate Milk. It seems to have a stronger chocolate taste. Ahh…Chocolate milk…First – Nestle Quik Strawberry and Chocolate powders have been changed for the WORST since my childhood! No comparison to how they used to taste! Second, why is it these companies NEVER seem to put enough chocolate in their chocolate milk? Third – Why oh Why did Nestle stop making their “Shakes”? 🙁 There were sold along side chocolate milk, in the 16 or 20oz. or so size, in the fridge. section of convenience stores. NO other chocolate milks tasted as good as that line did! They had OREO flavor, Vanilla flavor, Dark (or Extra) Chocolate and I believe a Caramel flavor. Thick, rich, delicious,,,why do companies always discontinue the best products? Last…if you want to be satisfied with YOUR chocolate milk, then buy “whole” milk, buy your own bottle of Hershey Special Dark syrup and YOU experiment and find your own best ratio! Happy mixing!! !